My occupation is laughing kid. Hey, welcome to my message wall. Q: Can I be <position of power>? A: I don't believe we're hiring at the moment. Either way, that's not an issue for me; if you want to be an admin, I recommend messaging Psychobilly. Q: What should I call you? A: Please call me simply PBE. As always, comment if I missed anything. 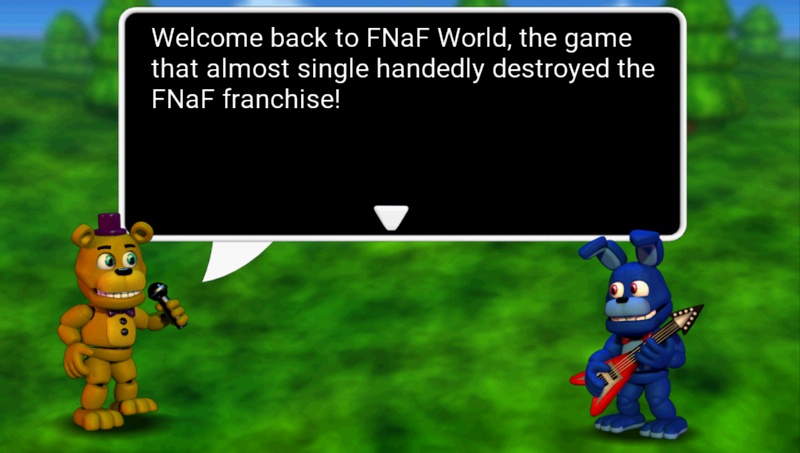 In this thread, there is a new discover on unlocking "8-Bit Fredbear" Trophy on cleaned, emptied FNaF World by doing a method in Ultimate Custom Night game. I am sure you will understand once you go there. This user messed up the stuffs today - had Fusionx cover the base in my absence (since I went out city today). Also, you need to updating your Message Wall Text - as Sheena is no longer online. vern or other user can take the requests. They all came from "Thank You" Poster, cut out and chopped out. Those simple not belong. I requested this as well. May you please do that, PBE? Done. Sorry about the delay, I do not really check Wiki anymore. PBEgaming wrote: Done. Sorry about the delay, I do not really check Wiki anymore. And you're still an Admin. I am looking after the Wikia since you guys left. Unless if you think that it's necessary, I can becoming an admin for this wikia just to clean the pointless articles and stuffs. Oh, never mind - you just killed it. Great! Thanks. I would personally be fine with that :) but that's not ultimately my decision. You would have to talk to Sheena about that. Indeed, but just forgot it. I didn't see that you took that article down fast. 1. Can I upload them? 2. Some lines of Fredbear's dialogue are extacly the same as the PC version. Should I upload those that repeat themselves, or would that count as duplicate images? 3. There already is one image of dialogue uploaded on this Wiki, hovewer, it's smaller than the ones I have. Should I upload that one too? Thank you. I've dealt with him.